HYDERABAD: Rubik cube since its inception in 1980s has intrigued children and elders alike. The fascination with the red-blue-green-yellow-white-orange angular plastic cube is such that today there is a global community of speedcubers. 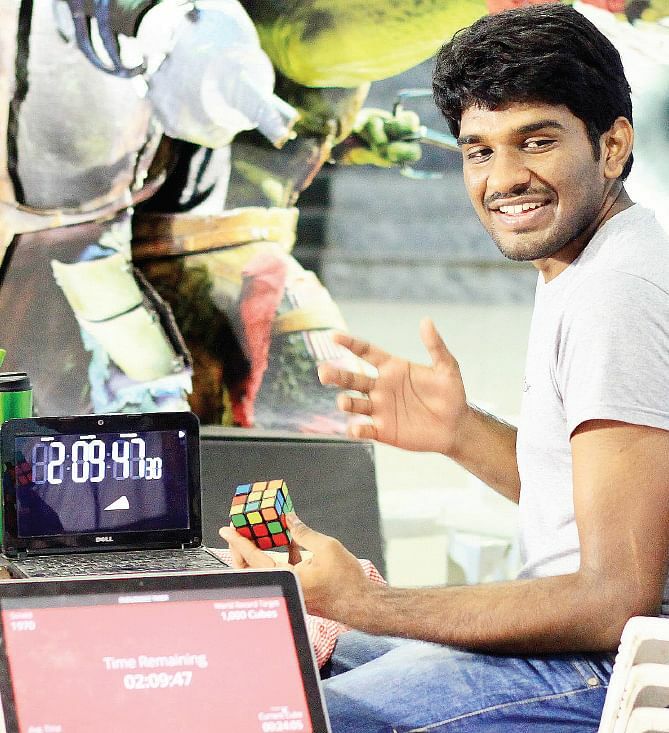 Taking speedcubing to a different level, is the city-based techie, Vamsi K Raju, who solved 2,176 cubes using one hand in 24 hours and entered the Guinness Book of World Records. At a time when teenagers battle identity crisis, Vamsi picked up the colourful 3x3 cubes and put all this heart and mind into solving it. Little did he realise that a decade later his passion will also be his claim to fame. “I am happy that I have been able to create such a record. I am a specialist in solving the Rubik cube with one hand which takes me 13-14 seconds,” he says. Though speedcubers across the globe and Hyderabadis, particularly, are gaga over Vamsi, to be able to attain the precision has been demanding. “Solving the cubes can can be very frustrating even for professional speedcubers. The only way out is to be patient, believe in yourself and keep trying. This has also my success mantra,” says the 25-year-old, who took to speedcubing three years ago. The IT professional at Quintiles, who participated in several international speedcubing events, says the general perception that any one who can solve the rubik cube is a genius is not true. Vansi, who can solve a cube not only with one hand but also with his feet in mere 20 seconds, says anyone can do it with a little bit of practice and use of algorithms. “At the international events that I went to, people would look at me in amazement and would ask me how could I do it so quickly. Their reactions sparked the idea of training myself for the Guinness world record for solving the maximum number of rubik cubes in 24 hours,” Vamsi explains and adds that though speedcubbing is catching up in the country, lot more needs to be done. “For speed cubing, I say the sky is the the limit,” he says. So what next for the holder of the newest rubik cube solver? “Though I still have a long way to go, for now it’s celebration time,” he gushes.